Carindale Library had its last CoderDojo Brisbane session for Term 1 on Saturday, where the kids were asked to work through different levels of Scratch challenges. Some of the challenges included making the cat move across the screen while leaving behind a trail of rainbow colours as well as a collect the coins game. It was great to see the kids engaged in Scratch, where they were able to experiment with the programs different features. A big thank you to all our mentors at Carindale Library for their support in running the sessions and helping the kids engage in different programming technologies. Sessions at Carindale Library kick off again in Term 3. To keep up to date on when registrations open, be sure to register to our website www.coderdojobrisbane.com.au or follow us on Twitter and Facebook. The robots attacked again on Saturday at CoderDojo Sunnybank Hills Library with the kids thoroughly enjoying programming Bruno the robot. You may be wondering how the robots work? Firstly, the robots are wirelessly connected to mentor Morry’s laptop. The kids are then able to program the robot using Scratch, with the robot completing each command. For example, the kids moved the robot left and right, they even had Bruno picking up and dropping a small tape dispenser on the table. It’s Sunnybank’s very own Transformer! Right: Our mentor Morry demonstrating the Robosapians to the group. Photo provided by our mentor Young. Our last sessions for Term 1 are this Saturday at Sunnybank Hills and Mt Ommaney Library – we can’t wait to see what the kids have been able to create! 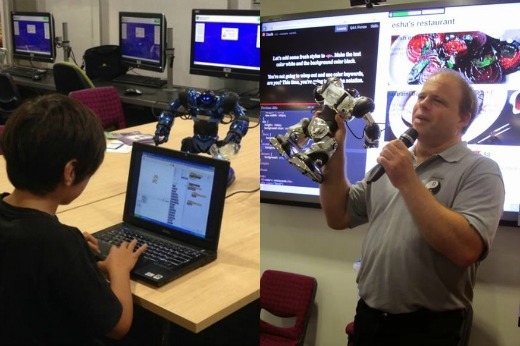 ‹ CoderDojo Chermside Library wrap up!